Consider the bonds highlighted in gray in the diagram below. a. First consider the bonds in molecules isolated from all other molecules (in a vacuum). Classify each of them into the four categories given above, based on your estimation of the bond strength. b. Which of these bonds could be broken readily by thermal fluctuations? 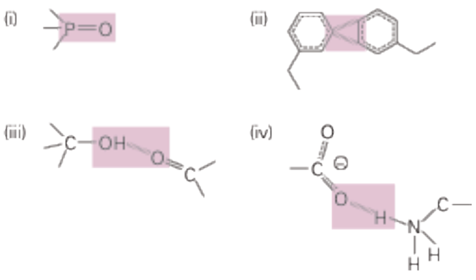 c. Next, consider what happens when these molecules are immersed in water (fully solvated). For each bond, indicate whether it becomes weaker, stronger, or stays the same in water. d. Which of these bonds could be broken readily by thermal fluctuations in water?